Opah is my mom’s mother. She and my dad’s mom (Tok) became really close after my parents got married and it was so cute to see. They would dress the same for Raya, they would sleep together, they would play with their grandkids together…it was nice that the 2 grandmas really got along. Tok passed away a few years back and Opah thinks about her all the time. She never got to see my sister marry or give birth, so Opah always feels sad whenever there’s a big event in the family because she feels a void. She insists on visiting Tok’s grave ever so often and whenever she does, she always wants me to come along. If not, she refuses to go. I’ve been so busy so I haven’t had the time to go lately. But I promised Opah to go one Friday morning (we only go early in the morning since it’s cooler and less hectic). Woke up early to go. Saw that it was raining! Opah and I had to postpone. I went to work. I wasn’t feeling well after a hectic week. I really wanted to wake up but I didn’t hear my alarm! My body just needed some more rest. When I woke up, Opah refused to talk to me. She has these kind of moments now; the older she gets, the more sensitive she gets. I totally understand that because it’s the same for most old people (Hi Mom, Hi Dad!! Hehe…). So I’ve just got to be patient and pujuk her like mad. When I apologised, she refused to respond. I shook her body, she refused to look at me. She merajuk big time. I had earlier arranged to take her out to lunch and off to my sister’s house to play with Little Niece and Nephew. I wanted to cry!!!! She was being so difficult. The maid looked at me pujuking Opah and the maid started crying!! We have never seen Opah this sensitive and she pitied me. I looked outside and the sun was shining brightly. It was too hot to visit the grave and I would think Opah would be too tired to walk in the hot sun. But I tried my luck anyway. “No, forget it. You have more important things to do anyway….meetings here and there…” she said sarcastically. Sigh… but I still kept on my cheery voice. “Come on, Opah. Let’s get ready k.” I went to take her headscarf and dressed her. Off we went to visit the grave. Thank God there was no one at the graveyard on a hot afternoon, so parking for me was easy. Wheelchair access is impossible on the narrow paths between graves, so I had to park as close as possible to the graves so Opah didn’t have to walk so far. The last time I went was months ago and I felt a lump in my throat filled with guilt. That’s what you get. You neglect your loved ones and when you want to find them again, you can’t. I searched and searched and finally, I saw her name written on the tombstone behind a tree. It was hidden by a tree that grew taller during the months that I had not visited her. When I found it, Opah walked slowly and we read the Yasin after . 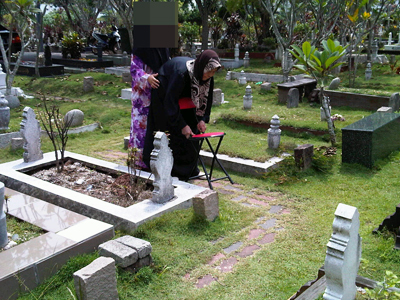 I poured water on the grave witnessed by Opah and we both prayed for her in silence. After the visit, Opah was back to her jovial self again. She was suddenly hungry and she suddenly wanted to go see her great grandkids. And I was happy to see her all upbeat again. And devoted the rest of my evening to her. Sometimes, elderly people just want attention and we have to be patient. Opah, for one, is a very very understanding grandmother. She just does her own thing and waits for all of us to come home (she still doesn’t sleep until I come home, no matter how late!). She knows I’m busy and she rarely asks for anything out of the ordinary. And when she does, we all make it a priority. And we should!! She raised my mom up in hard times, and without her, I might not even exist. it’s true,we just have to be patient to the elders as they already sacrifice and put up with our nonsense from our childish manners long time ago.you’re such a great grandaughter. my grandma is 85yrs old, and she still strong but everytime she said something sometimes it will hurt others people feelings but we as their children understand that the only way she is trying to express what she felt at that particular time..so we just make a joke for everything that she said so that she and we don’t feel hurt and laugh after that. p/s : we love and take good care of our elders, allah will anugerah the same kind of kids to us one day. morning dear. saya ada nenek yang seusia dengan nenek kamu. lately, dia sangat sensitif. every morning saya akan suap dia breakfast sebelum pergi kerja. 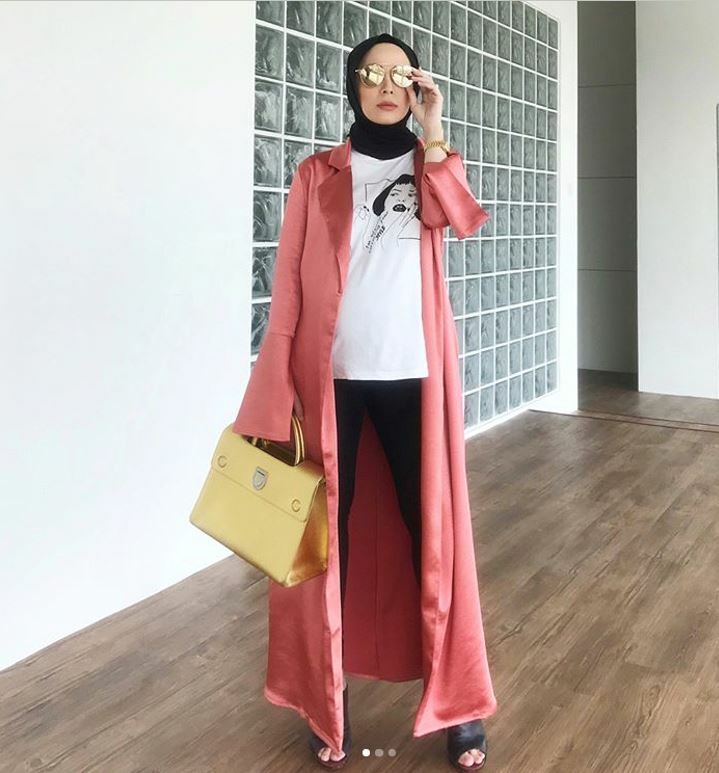 ada masa-masa yang dia moody, dia marah-marah tak nak makan/ buang-buang makanan. memang menguji kesabaran. my mom selalu pesan, setiap apa yang kita lakukan akan dibalas Tuhan sama ada cepat atau lambat. sayangilah mereka selagi mereka masih ada disisi. alhamdulillah, my mom adalah my best idol. dia jaga ibu mertua tanpa bantuan maid. mandikan everyday dan beri layanan yang terbaik. sangat penyabar. even my mom berkerja dia tak pernah miss laksanakan tanggungjawab dia. *terharu. Vivy, your last sentence is sooooo touching.Thanks for your kind reminder.Luv you. 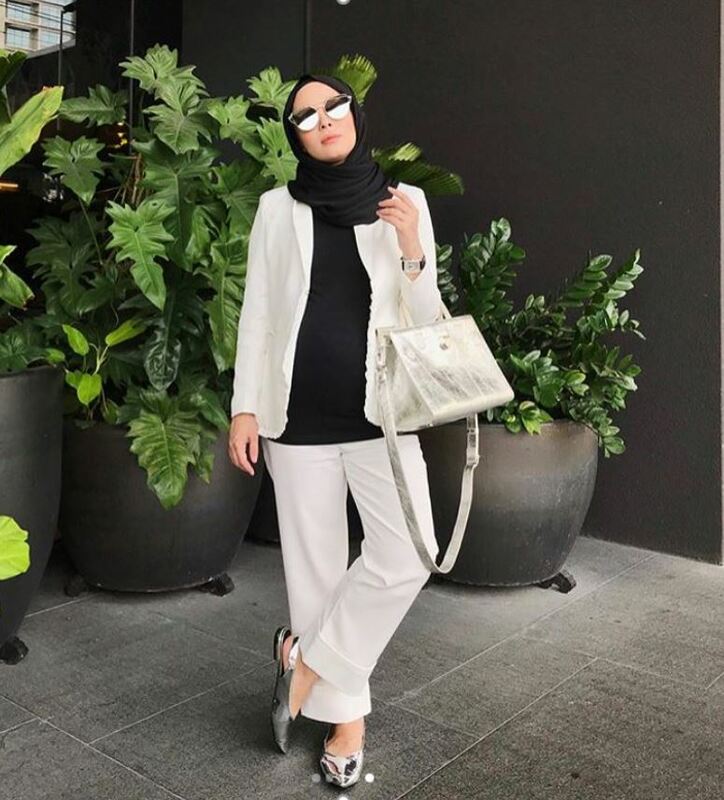 Semoga Opah dipanjangkan umur & diberikan kesihatan utk tengok you berkahwin….ameen. A very understanding grand-daughter indeed! Thanks for the reminder VV! i’m soooo touched with this entry… really missed my nenek…. i’m one of your new fans..
true, need to take a gud care of opah or anyone that is older than us. Now, I’ve only have 1 nenek and 1 aki, both from my mom’s side. My dad just passed away, that makes me sad most. I wish his here, to play more with my son, his only grandson. A kind and honest grand daughter goes a long way.. may Allah bless you always.. Indeed you’re right!! My mum merajuks sometime too. =p and my grandma… well, dont even go there. but it is cute. press “LIKE” button thousands times!!! salute Opah! salute PD!! tsk tsk… moving indeed. like others, reading this post reminds me of my late onn (that’s what we call our grandma). i wish i had your patience back then. now i can only pray for her to be placed together with the syahids. ameen. you’re so lucky cause you still have time to spend with your opah. everytime i read your posts about opah, i’ll always remember my late grandmother. she used to wait for us after school and comes in the room when we’re sleeping. i really miss her..
We tend to forget what IS the most important thing in our life. Appreciate them..while they still with us! I admire how you emphasize on respecting the elders and spending time with them. This is so rare with the younger generation nowadays seeing that we are often busy with something be it work/events/party or just anything. Your entry reminds me of how I should spend more time with my parents and the elders. Every entry on your Opah is a very strong reminder to everyone out there. I always love your posts about Opah! They always tear me up and make me think of my grandparents back at home. aiyo, this brought tears to my eyes and I am reading this in office….luckily my cublicle is secluded so no one can see me. thank you all for the kind comments… i am so glad to know some are taking this positively to my indirect message that we should respect elders… and really nice to hear your grandparents stories as well!! Aunty Faridah: your comment touched me, especially on the pahala part. 🙂 thank you so much for saying those words to me and i am so happy you and your daughter read my blog. btw ur opah can speak english ya?? ?